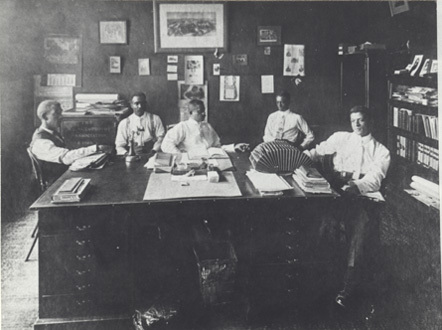 These men were officers of the North Carolina Mutual Insurance Company ca. 1913. Left to right: Dr. Aaron Moore, John Moses Avery, John Merrick, Edward Richard Merrick, and Charles Clinton Spaulding. In 1898 John Merrick found investors, include Dr. Aaron Moore, and founded the North Carolina Mutual and Provident Society, a life insurance company that began operating April 1, 1899. Many of the investors pulled out in the first year, and the company was reorganized on July 1, 1900, with Merrick and Dr. Moore as principal shareholders. Charles Clinton Spaulding was promoted from part-time agent to manager. By the second decade of the 20th century, the North Carolina Mutual Life Insurance Company LINK was thriving. John M. Avery, who was appointed Spaulding’s assistant around 1907, was one of the main reasons for the company’s success. Walter Weare, historian of the Mutual, states that, “It would be difficult to overestimate Avery’s influence on Spaulding and the management of the Company. He perfected Spaulding’s innovations, schooled the manager in the art of public speaking, improved his business correspondence, and generally provided the polish that enabled Spaulding to become a respected national figure.” Having begun his career with the company as a field agent, Avery laid the groundwork for the organization of all field personnel. Joining the board of directors of the company in 1911, he took his place with Merrick, Moore, and Spaulding as a top leader of the company. He provided thoughtful guidance, similar to that of Dr. Moore. Edward Richard Merrick was 10 years old when his father, John Merrick, organized the Mutual. From the beginning he helped around the office. After college he worked as a clerk in the home office and then as a traveling agent. He established the Mutual in Georgia under Avery and Spaulding’s tutelage. In 1913 he returned to the home office and spent almost his entire career as treasurer, retiring in 1957.